... at The Beat's closing-down sale. 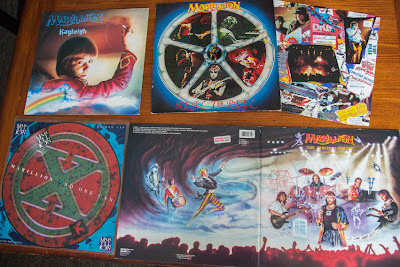 Four Marillion vinyls! "Real to Real" (recorded in Montreal, Canada, at at Leicester's DeMontfort Hall! My hometown Leicester! ), "No-One Can" picture disc, "Kayleigh" 12-inch single, and "The Thieving Magpie" promotion double-album.